Thank you for visiting PAL Robotics at ICRA 2016! Last week the key stakeholders in robotics field worldwide gathered together at Stockholm (Sweden) to attend ICRA 2016. Five intense days with multiple sessions and presentations to disseminate the most advanced research in robotics were coupled by a very interactive exhibition. 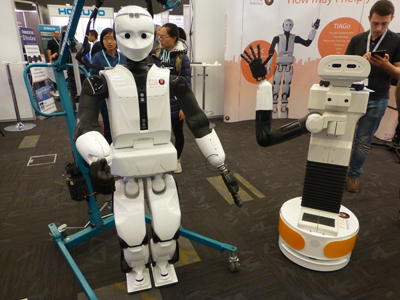 PAL Robotics’ humanoid REEM-C and mobile manipulator TIAGo were at the venue, available to play with anyone who wanted to. Humanoid REEM-C loved going for walks all around the ICRA 2016 exhibition area, mixing up with conference delegates and visiting robotic colleagues from other stands. 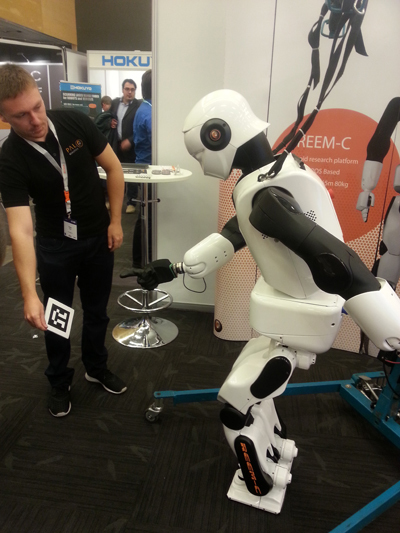 The demo which attracted most attention was a Whole Body Control software used by REEM-C to accomplish one goal with its whole humanoid body – in this case, the goal was to point at a marker with its index finger. This specific demo was developed for the socSMCs EU FET project. Attendees could try themselves to smoothly move TIAGo’s arm in gravity compensation mode, or feel its strength by handshaking. The mobile manipulator was also guided through the venue by pulling its arm, and used the PAL Robotics’ Whole Body Control software to track a marker and keep pointing at it while avoiding its joint limits. TIAGo is suitable for research in both Ambient Assisted living and industry 4.0 environments, and ICRA 2016 demos showed different possibilities the robot opens. ICRA 2016 Industry Forum invited PAL Robotics as a speaker, under the theme “Partnering for modular, open solutions to meet industry needs”, hosted by Combient. Our Business Manager Carlos Vivas explained how industry can be enhanced by modular robots, as PAL Robotics develops platforms that are very modular and also suitable for Industry 4.0, such as TIAGo or PMB-2 mobile base. In fact, as Vivas pointed out, “TIAGo has the essence of what we learnt among the years: modularity is the way”. Modularity – both in hardware and software – reduces complexity and makes it easier to integrate production lines for factories. 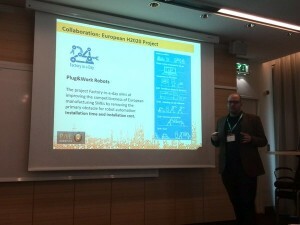 Modular and open technologies are the basis for Factory in a Day, a EU 7th framework project in which PAL Robotics is involved. Its goal is to reduce the system integration time of a supply chain, using modular robots to optimize production line changes. The project was also presented at ICRA 2016 Industry Forum.